Young Russian driver Daniil Kvyat swept to a career-best second place at the Hungarian Grand Prix on July 26 to notch the best-ever result for Russian Formula One. The 21-year-old overcame technical problems to finish above championship leaders Lewis Hamilton and Nico Rosberg and move within six points of seventh place in the driver standings. 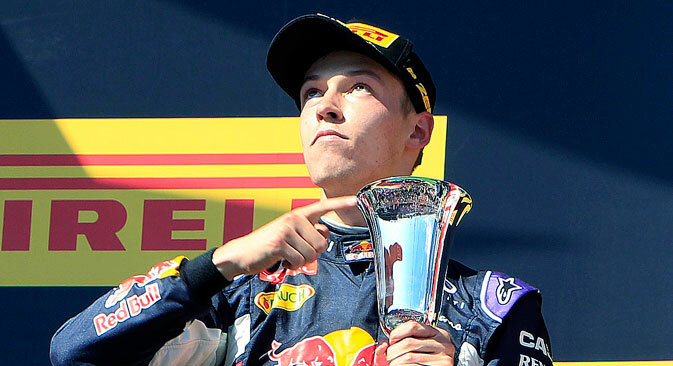 Rookie Russian driver Daniil Kvyat has achieved the best result in his Formula One career so far, coming in second at the Hungarian Grand Prix on July 26 to become the second-youngest driver in the sport ever to achieve a podium finish. Not only was the second-place finish at the Hungaroring a career best for Kvyat, it also set a new record for Russian Formula One, eclipsing Vitaly Petrov’s third place at the 2011 Australian Grand Prix. Red Bull Racing team driver Kvyat was in seventh position on the starting grid. However, due to difficulties experienced by a number of drivers, including championship leaders Lewis Hamilton and Nico Rosberg (who finished sixth and eighth, respectively), the Russian managed to work his way up into second, despite some technical problems at the start of the race. “At first I thought that my race was over because there was massive vibration. But the team told me to press on and today I fully realized the meaning of the phrase ‘never give up’,” Kvyat told journalists after the race. Victory at Hungaroring went to Scuderia Ferrari's German driver Sebastian Vettel, while Kvyat’s fellow Red Bull teammate, Australia’s Daniel Ricciardo, finished third. Kvyat’s second place in Hungary meant he had reached the F1 podium for the first time at the age of 21 years and 91 days. The only person to have achieved this at a younger age is four-time champion Sebastian Vettel: The German won the 2008 Italian Grand Prix at the age of 21 years and 73 days. The best result Kvyat had notched this season so far was fourth place and he has experienced numerous problems with his car, with the management of Red Bull complaining that the recently introduced Renault engines were not as reliable as those of the team’s main rivals, Mercedes and Ferrari. In an interview with the Kommersant business daily, the F1 adviser to the president of the Russian Automobile Federation (RAF), Igor Yermilin, said that in Formula One too much depends on the car. The Russian is currently eighth in the driver standings with 45 points, six behind teammate Daniel Ricciardo who has 51. Kvyat dedicated his Hungarian success to the former Marussia Racing driver Jules Bianchi, who died on July 17, having spent several months in a coma. The Frenchman was badly injured in a crash during the Japanese Grand Prix in October 2014.